This spring the Danish Architect’s Association arranged their very first architecture competition for children. 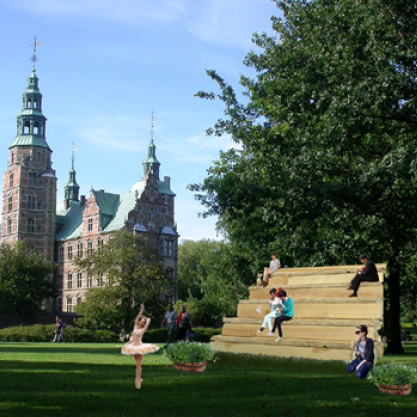 The task was to design a mini-pavillion for Kongens Have in Copenhagen, and by doing so, the children should gain an understanding for architectural practice and develop their competences in relation to democratic processes. At arki_lab we believe strongly in these democratic values, and we work to develop a common language concerning architecture, so that our physical surroundings can become a matter for everyone to discuss. That’s why we where enthusiastic to be collaborating with Himmelev school in Roskilde to participate in this competition. The project integrated both history, when the pupils learned about Christian the Fourth and Kongens Have, and design-thinking methods and architectural tools, when they were to analyze and design the exteriors of their school. Finally, three intense days of hard work resulted in several designs of pavillions, that had been adjusted to fit Kongens Have and the competition requirements. The pupils worked in groups, and developed sketches, plans, sections, models and collages of their ideas and final design. Our hope for the project is that the class can find funding so that one or more of the pavillions can be built by the pupils themselves, in collaboration with the Technical High School. At arki_lab we believe that it can have a positive effect both for the pupils and students involved in projects like this, but also for the overall success of the architecture of the schools, when children and youth are engaged in co-creating their own schoolyards and classrooms. We also believe that this low-scale insight into the benefits of participatory planning are translatable to the larger scale of society.